A goal and an assist on the opening weekend for Christian Pulisic were enough to send his Borussia Dortmund side top following a 3-0 win at Wolfsburg. In the absence of Ousmane Dembele and Marco Reus, the 18-year-old was given a chance to shine from the start at the Volkswagen Arena – and shine he did! After scoring Dortmund’s first competitive goal of the season against Bayern Munich in the Supercup, the USA international quickly opened Borussia’s account in the Bundesliga with a superbly taken driven shot across Wolfsburg goalkeeper Koen Casteels. 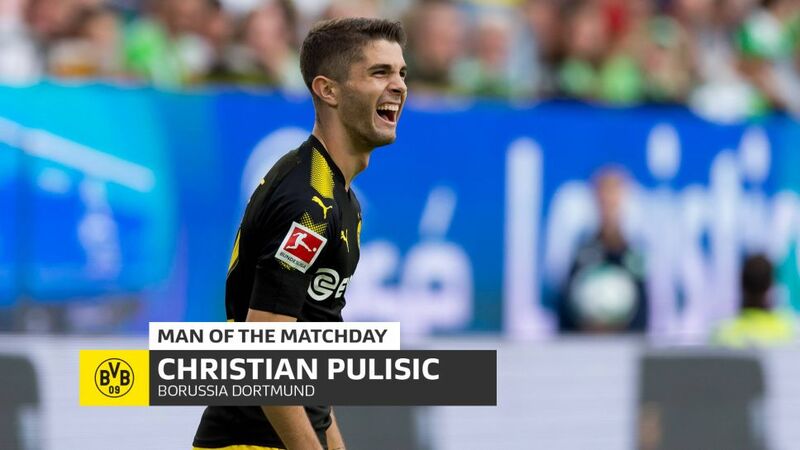 The wonder kid’s wonder day did not stop there though as he was the architect for Dortmund’s third that sent them top of the early Bundesliga standings. Running clear down the right wing, Pulisic sent an inch-perfect ball across the face of the Wolfsburg goal for 2016/17 top scorer Pierre-Emerick Aubameyang to simply tap home. "Such a win on the first day of the Bundesliga is of course very important for us. We played very well from kick-off on," Pulisic said after the game. "I would probably give my goal a B grade. Marc's goal was a little bit better, an A grade for his effort." Watch: Pulisic "wanted to show what we're about"